In the project, in the Start tab, in the Sections group, click Planning. 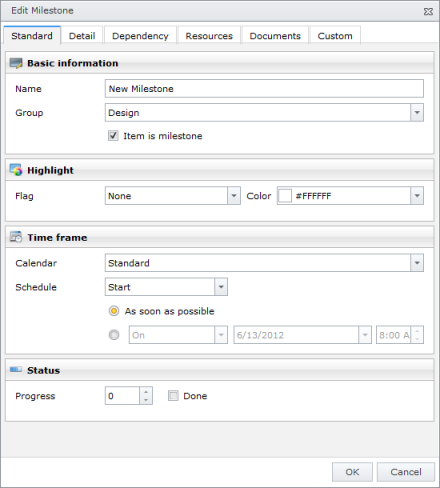 Create a planning by adding planning items such as milestones. In the Planning page, in the Edit group, click New Milestone. Enter a name directly in the row. In the Highlight area, select from the Flag drop-down list a color to mark the milestone in the planning list. You can also select the color to mark the milestone in the Gantt chart by clicking Color and choosing some from the drop-down list. In the Time frame area, define its completion date and dependency regarding other planning elements. Unlike an activity, a milestone has no duration. In the Description field enter some important information on the milestone, e.g. the wished deliverables or internal remarks. The information from the Description field will be sent via notification to the divided resources. See Display and process work package for more information about the InLoox PM notifications. In the Location box enter a location. InLoox PM Web App creates the chronological interdependency between the milestone and the selected successor. The Selected list contains all successors of the planning elements currently being edited. To remove a successor click on the button <<. InLoox PM Web App deletes the chronological interdependency between the planning elements and the selected successor. Create and edit a milestone - InLoox • Copyright 1999-2019 © InLoox GmbH. Reservados todos los derechos.